Every moment of your wedding day is going to be captured and you want to make sure you’re looking your absolute best! When it comes to the grooms and groomsmen attire, everyone thinks it’s just “putting on a suit,” but it’s much more than that... This year, men's wedding fashion is stepping it way up. For the past couple of seasons, mismatched dresses for bridesmaids have been the hot trend. But it’s 2017 and it’s time for groomsmen to start catching up to this trend. For the same reasons the ladies started this, men too could benefit from it- it’s financially favorable, easier when planning long distance weddings, and allows the groomsmen to give their own touch to their outfit. Color is the easiest way to express individuality and great way to incorporate your wedding theme colors. In the previous seasons, groomsmen use color through socks, braces, ties, and pocket square. This year is all about colored suits- especially jewel tones of blue, purple, and emerald. If you don’t want something so bold, pastel colors aren’t just for the bridesmaids. Deco styled looks is a popular trend when it comes to men’s wedding fashion thanks to the old sport, Jay Gatsby. 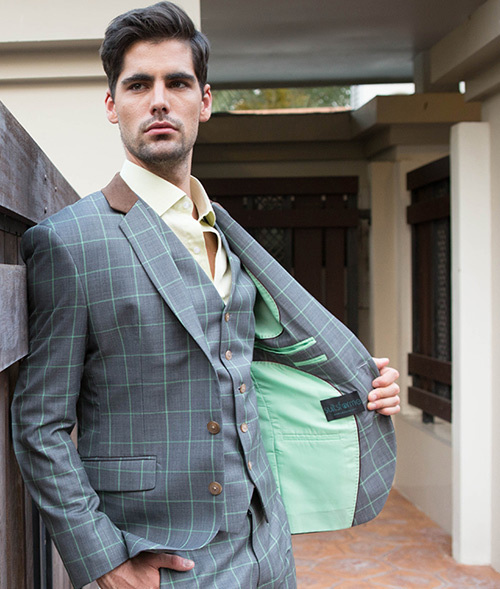 From top hats to three-pieced suits, Deco is the perfect look that can be played with to be formal or casual. For a more formal look, try a classic black 3 piece suit with satin lapels, white dress shirt, and a black or white bowtie. Or try a white blazer with black dress pants, vest, and bowtie. For a more casual look, try a brown plaid 3 piece suit with a pastel colored dress shirt or try a white 2 piece suit, beige vest, and pastel colored dress shirt. Deco is all about being dapper and looking opulent. Another vintage trend is the english heritage - a casual look with a touch of old world classic elegance. A style built on wool, plaids, and herringbone paisleys. Try a double breasted plaid suit, solid colored dress shirt and tie, paired with Brogues or try a solid 3 piece suit with a paisley pockerchief to match your tie. They say don’t judge a book by it’s cover, but lets face it, our ‘cover’ is the first thing people see. Your style is a statement about where you want to be, how you want to be treated and who you are. It can change or establish other’s first opinions about you and is a great way to express yourself that can influence how you feel and even how you perform; for example, a great suit might make you feel more prepared and confident to nail that presentation, that pitch, that proposal, that interview or investor meeting. Some of the most stylish guys around have a few key items they put to good use. While having a killer wardrobe might sound like it’s going to take a lot of money to do, if you focus on these 3 items as a foundation, you’ll have what you need to make your moves as stylishly as possible. This is a non-negotiable. As an ensemble, the power suit exudes power and confidence and says “You got this.” Split up into the 3 pieces, you have power suit elements that you can mix and match with plenty of other pieces in your closet, depending on the occasion. For a completely formal look, the 3 piece suit is ready to go. For business formal, you can lose the vest and keep the blazer, dress shirt and dress pants. For business casual, you’ll have the dress pants and dress shirt on deck; and for a casual Fridays look, you’ll need just one of these elements to mix with a casual piece. An off the rack suit might get the job done, but it’s those miniscule details in the stitching, the lines, the smoothness of the material and how it frames you that is going to sell your look. Off the rack can be ill-fitting and bulky, making you look generic and sloppy. It’s crucial that you get an expertly tailored suit to ensure that you have a much cleaner look. A man who’s going places, figuratively and literally, should have impeccable taste in shoes. It’s the period on the sentence of your look; imagine Idris Elba on the red carpet in a black and white classic suit, rocking some Crocs...see what we mean? It’s a pretty dramatic example, but it can be applied more subtly. The point is - your shoes finish your look, so they need to look great. Quality dress shoes can come in a variety of brands, models and colors, for example: Oxfords, Derbys, and Brogues. If you’re attending a wedding or a more formal event then you should wear the oxford or derby shoes; however, if you’re going for more of a casual look then you should go with the brogues. You’re going to need at least one or a few custom made dress shirts. You might think a made-to-measure dress shirt might be unnecessary, since dress shirts are under a blazer; but they have the versatility to be worn without a blazer at times and this is when the quality is going to be obvious. Also, an off the rack shirt isn’t ever going to fit your torso, chest and shoulders perfectly; with so many unique body types, an off the rack shirt might bulge in some areas, and bunch up in others, creating weird lumps and shapes under a blazer. Being a winner sometimes starts with feeling like a winner. And looking like one might just be that first step you needed to start getting to those places that you’re going. Invest in these key pieces and you’ll be well on your way! Reaching Friday means you made it; you powered through the week and achieved what you set out to do. Lose the stuffy Monday getup and go for a more casual, laid back look. Now, we don’t mean untidy - we’re talking an outfit that still says ‘I mean business’ during the day but is relaxed enough to take you to happy hour later. The right Friday outfit is an art; you want to look like you’re here to get things done, but you’re going somewhere better later. That means, in Laymans terms: contemporary, clean, and comfortable and never uptight. The goal is to look and feel like a million bucks. And off the rack suits are not making the cut. The name of the game is customization with a signature style. An expertly tailored suit gives a polished, clean-cut look versus the cookie-cutter suit that only looks good on the mannequin. A man’s shoes are the foundation of his style… every man should own certain key styles to set the foundation to his closet. They’re an essential piece that can set the tone on your look. The styles should range from casual to formal, come in a variety of materials and colors, and have soles that can survive all weather conditions. The Oxfords: Not your everyday shoe, but still a necessity when it comes to any formal event. The cap toe style is perfect companion to your suit or if you want a dressier workplace shoe, then the whole-cut style is your goto. Made from leather, they’re normally black or brown. Derbies: Perfect for dressing up a pair of jeans or adding an audacious look to your suit, Derbies are a completely versatile shoe. Less formal than Oxfords, they’re distinguished by the fact that the shoe lace tabs are stitched on top of the shoe itself. The Chelsea Boots: Made from either suede or leather and detailed with elastic bands and pull tabs for an easy, flexible fit. Perfect for the “suited and booted” look. Think about your dress shirt as your support system. It’s what compliments your sport jacket, it frames your face, and with shape it enhances your masculine silhouette. You’re dress shirt is an essential piece because it can be worn under a blazer or by itself with a tie or without a tie for a business casual look. Regardless of how it’s being worn, your dress shirt should fit perfectly to define your silhouette. A neutral colored cotton dress shirt lays the perfect foundation for your day to night look.